and whoa, what happened to THAT week? As Gretchen Rubin says, "The days are long, but the years are short!" 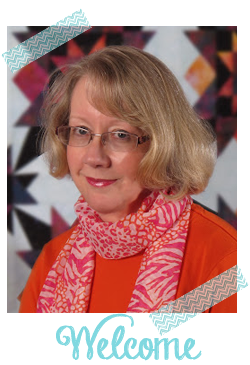 I know one day disappeared when I went to the 5th birthday party for Front Range Modern Quilt Guild. What a great group! On the way home, I enjoyed a little "stash enhancement" at Sew-ciety in Castle Rock. They're all settled in to their new location, and better than ever. You know I can never resist a good text print. 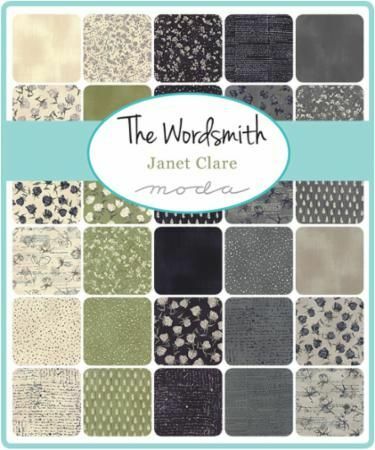 And this new Moda collection, "The Wordsmith" by Janet Clare is a winner. The background is a creamy off-white. And instead of actually words, Janet used squiggles in varying tones to suggest text. 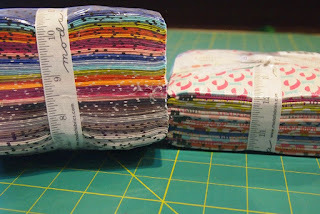 I only bought three half-yard cuts, but the whole collection is yummy! 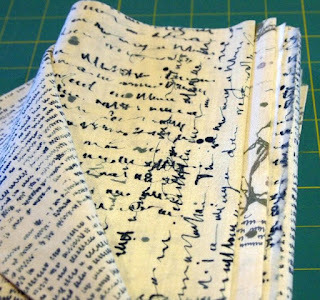 Janet blogs at Janet Clare, and I'll be returning to take a closer look at her blog as soon as I finish this post! In other exciting news, Vol. 2 of Scraps, Inc. is in shops now! 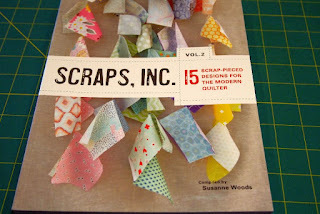 Chock full of inspiration for scrap hoarders like me! 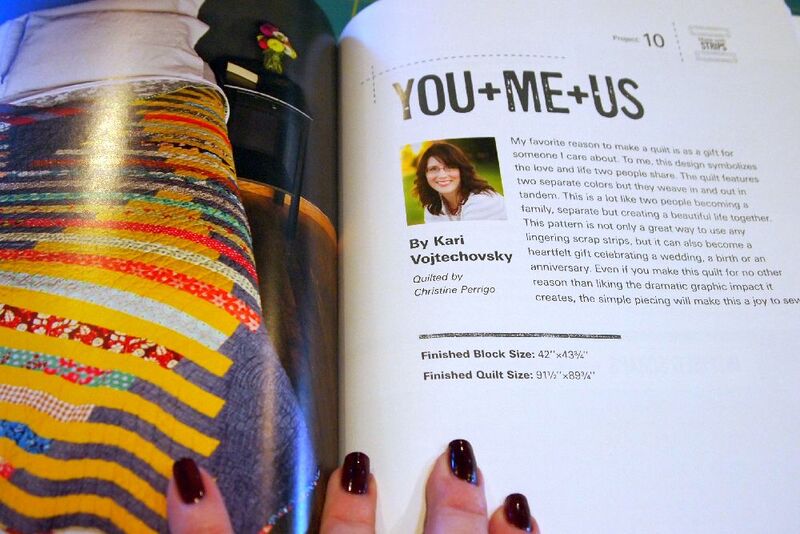 And most exciting of all, Friend Kari V. is a major contributor! 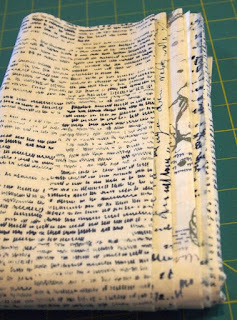 Not only did she design a pattern for the book -she designed the book! 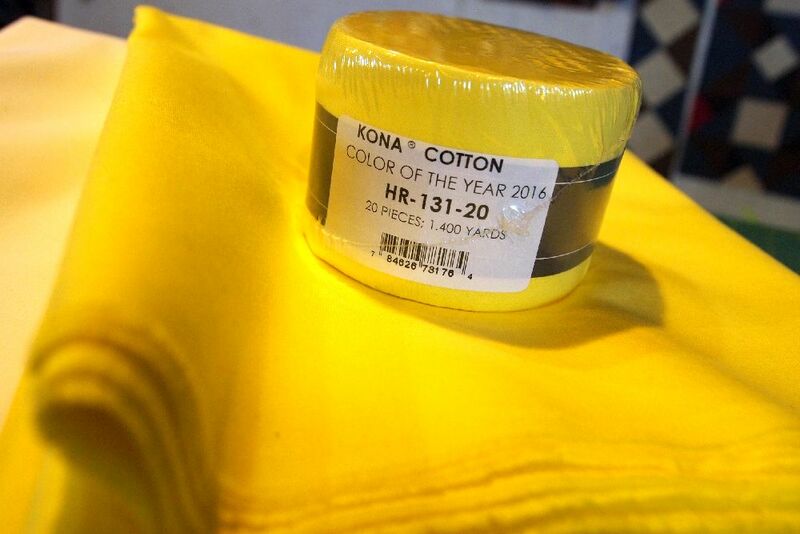 My Design Wall Monday will feature Kona's Color of the Year, "Highlight." If Pantone's pink-and-blue is too subtle for you, try this screaming yellow! I tried hard to capture the brilliance of the shade, but inside photos just can't. Trust me, it's the yellow of the original hi-lighter pens! 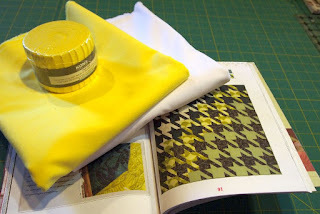 I'm planning a Houndstooth check quilt a la Tula Pink -- with a surprise! 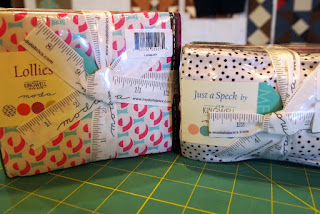 Ruth's Stitchery continues to grow their "modern" fabric collection. 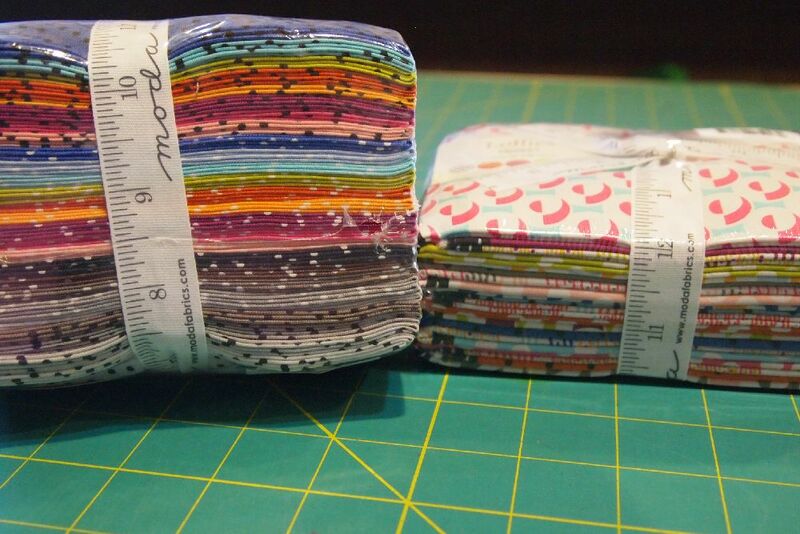 I squealed like a little girl when Sonya opened these two new precuts from Jen Kingwell. Lollies is an obese-eights collection. Each yard of fabric contains eight prints! I couldn't bear to open mine yet, but here is a link to Moda's website where you can see all the prints. The Wilmington trunk show at Ruth's was a big success. It was more like a "many trunks" show. 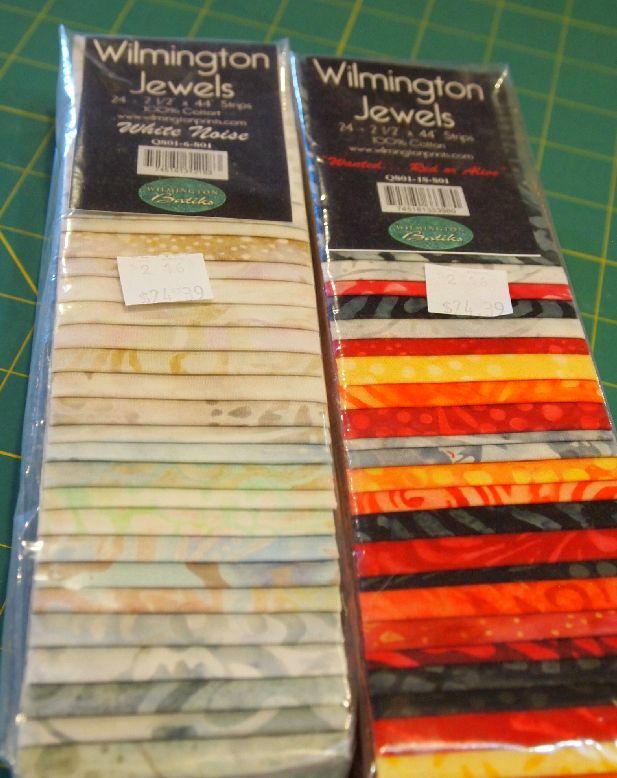 The quilts were made with Wilmington's Strip Packs in both cottons and batiks. 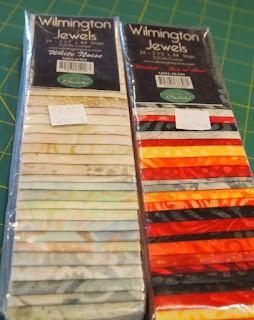 I hoarded "Jewels" (batik strips) in two colorways. 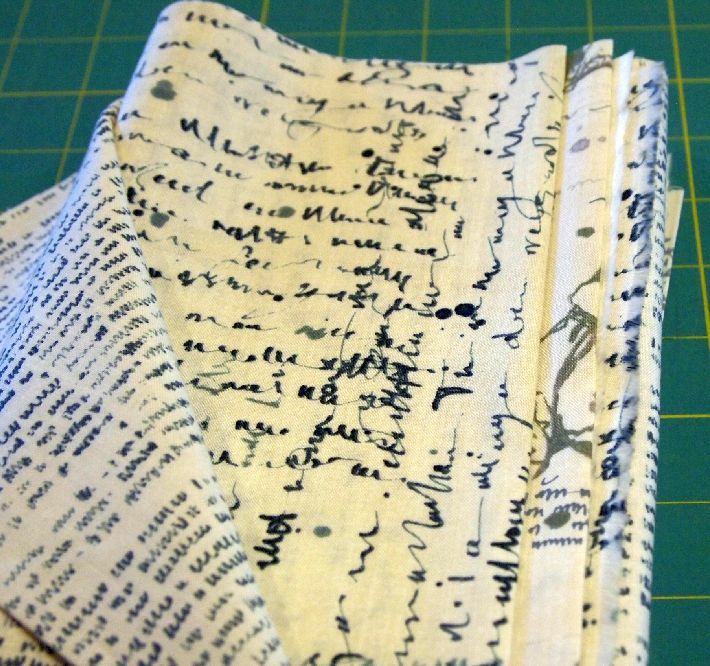 I think they will make spectacular "Rolling Fields" quilts, don't you? Which reminds me, I haven't shared my Rolling Fields quilt yet! Last, but certainly not least, my new "low volume" subscription from Pink Door Fabrics has begun. 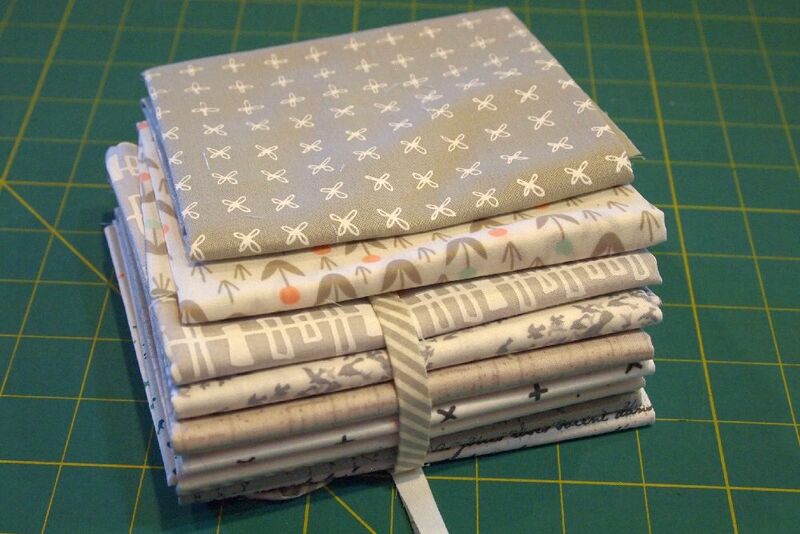 Chelsea has promised to send me a list of what the fabrics are -- the only one I recognize is Blueberry Park. 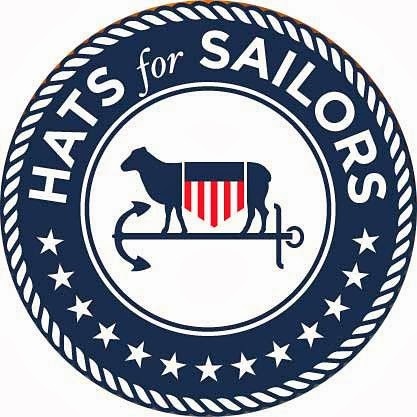 Are you ready for Tuesday's UFO Parade? I'm not, but I hope to be by then! 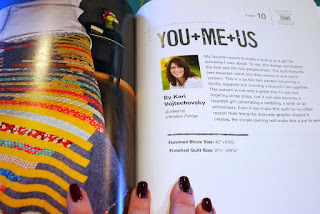 I had a low volume subscrption last year and loved it. Ooh! Jen Kingwell's new lines are all spots and blenders. I like the look of those too! Hi Aunt Marti, I missed you at our FRMQG retreat. But it was great to see you at the anniversary party. 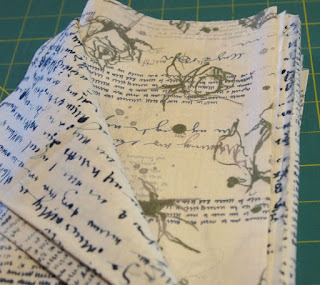 I have a fat quarter bundle of The Wordsmith for sale at www.karensstash.etsy.com for $72.